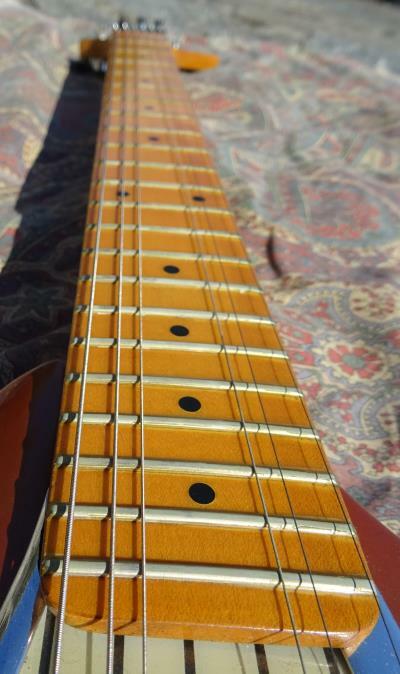 American Showster first gained recognition in the guitar market with the introduction of its '57 tail fin-shaped guitars in the mid-to-late '80s, and then later with its metal-loaded guitars, which used metal inside of the guitar bodies to add extra sustain. 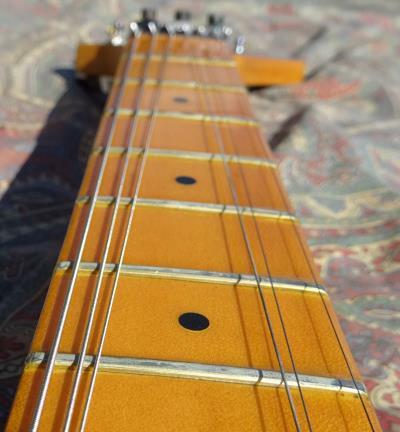 What has always set American Showster guitars apart tonally is their creative use of metal to enhance the guitars' inherent sound and sustain qualities. 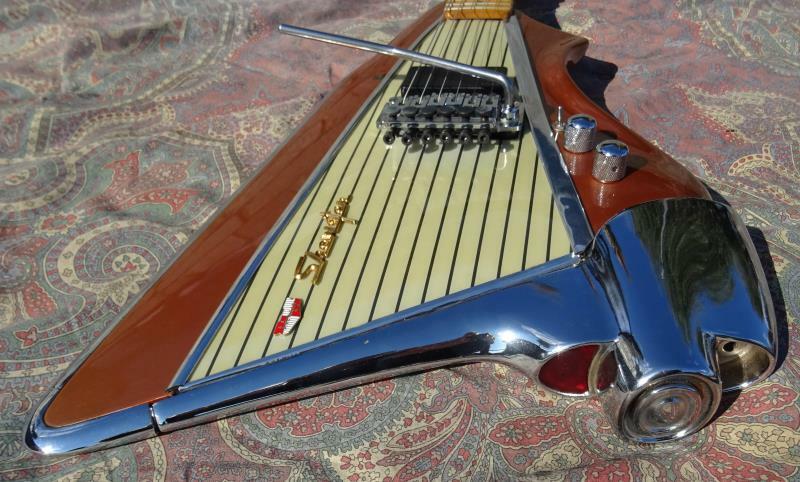 Compared with the '57 tail fin guitar, the Icepick is a much more conventional-looking instrument, but it still reflects the company's automotive motif and also uses metal to augment the guitar's sound. The original American Showster "company got started in about 1984 in Maplewood NJ. It was started by Rick Excellente, who was originally from the Jersey Shore. 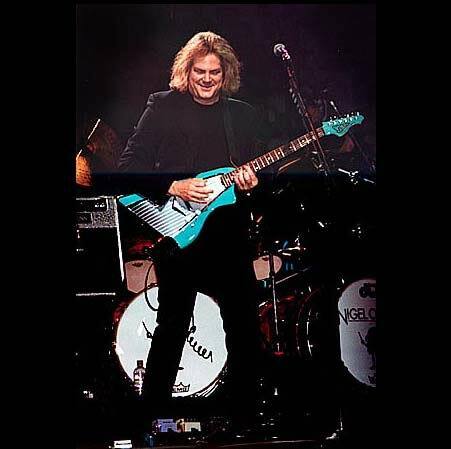 I worked at the Maplewood store front, building the 57 Chevy guitars until we moved to Palisades Park NJ, into a factory setting. The Maplewood store as a regular music store. I also did repairs and stuff like that there. He closed the store on Springfield Ave at that time. About that time Kramer started distribution. Rick was friends with them and they painted the very first Chevy prototypes. The first couple was hand caved by an artist in South Jersey, who's name escapes me at the moment. 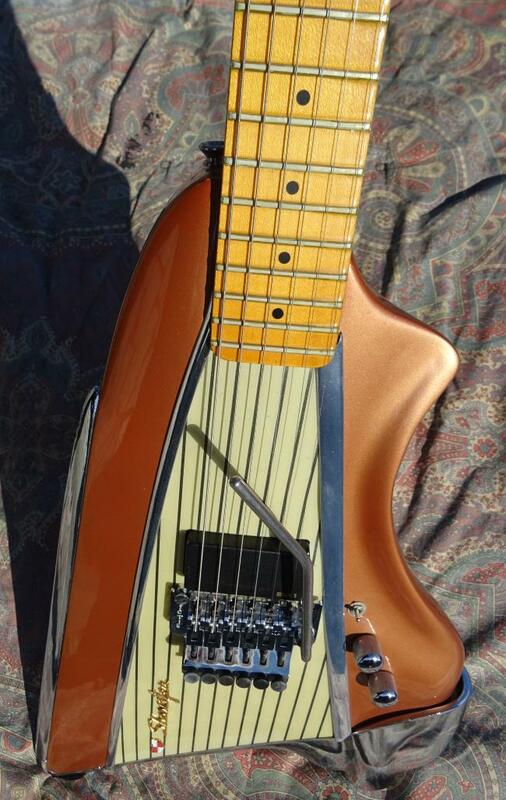 Also around the time we moved to Palisades Park I started designing a more standard looking guitar that would be easier to build, and still utilize Rick's patents on the metal loading. 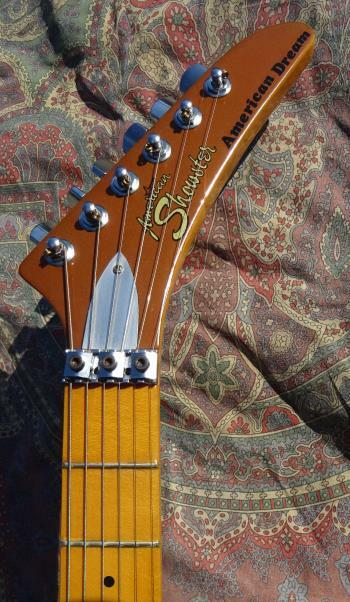 These became the American Showster Kramer guitars. I left the company right before they were released and didn't see them until I was reading a Musicians's Friend catalog! Rick was not a good businessman, and eventually he must have lost his patents to the new owners, Bill Meeker and David Haines. 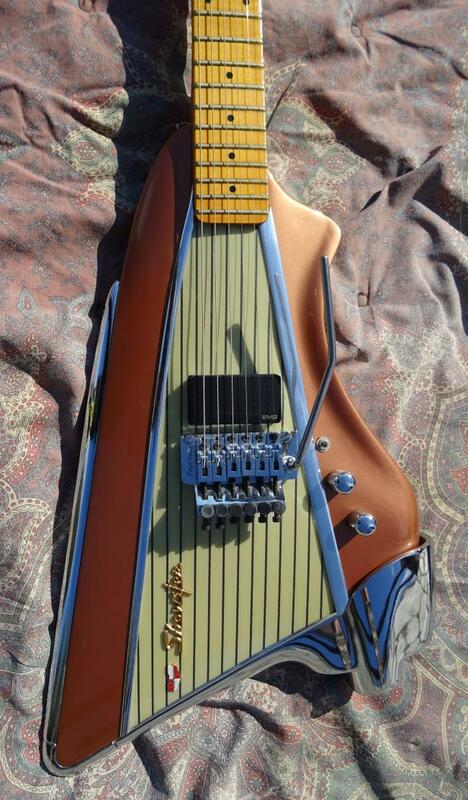 Those Chevy guitars looked very different from the originals. 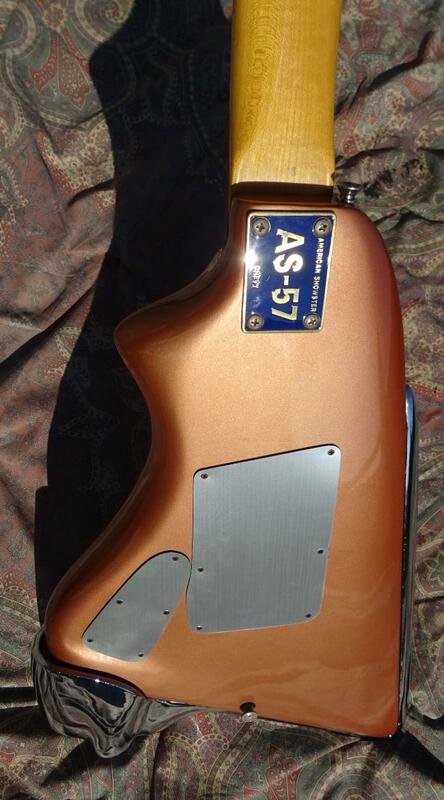 They also did the gas tank guitar, which was not one of the original designs. 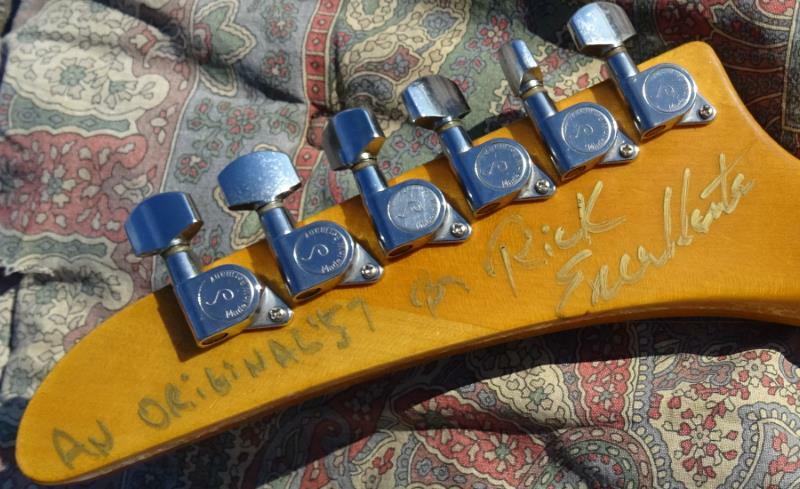 So a lot of the Chevy guitars were made by Rick, or whom ever he could get to work for him (until he neglected to pay them, as he did with me). 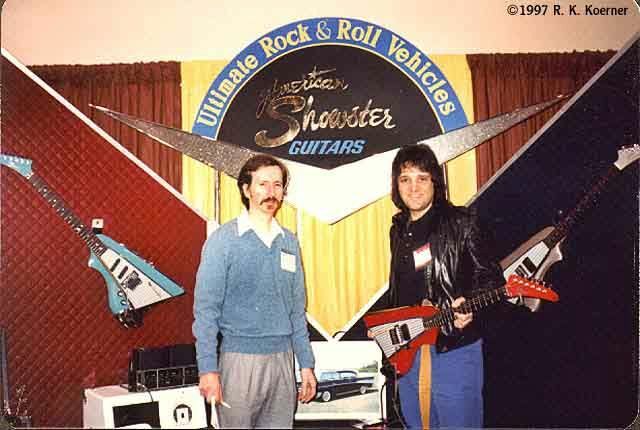 I left and started SGD Lutherie with John Gagliano who also worked at Showster. I have another old friend who worked there as well before I was there. Here's Rick on the right. The guy on the left runs Time Electronics, who worked on the first few prototypes for Rick. Bay Area keyboardist Harry Mello and guitarist Dave Crimmen (known back home as Xtender) recently yanked the flowers from their hair and headed south to the evil city of LA where they proceeded to make the A&R rounds with their new demo. 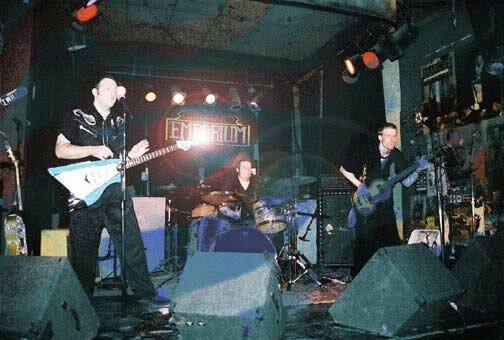 Crimmen's songwriting expertise has attracted the attention of Carl "Blue Suede Shoes" Perkins, who turned Jerry Lee Lewis on to a copy of the tape. The Killer, in turn, then passed one on to Fats Domino, making it a well-traveled piece o' plastic. The pair are quite the odd couple. Mello's shaved head and stocky frame coupled with Crimmen's lanky rockabilly bod topped with a pompadour, make for quite an entrance at any record label office. Despite the smog, the Bay boys sound the land of Sodom, Gomorrah, and mini-malls to be a very positive experience during their week's stay. Before hopping on their flight home, Dave scored an original American Showster guitar at the Guitar Center. 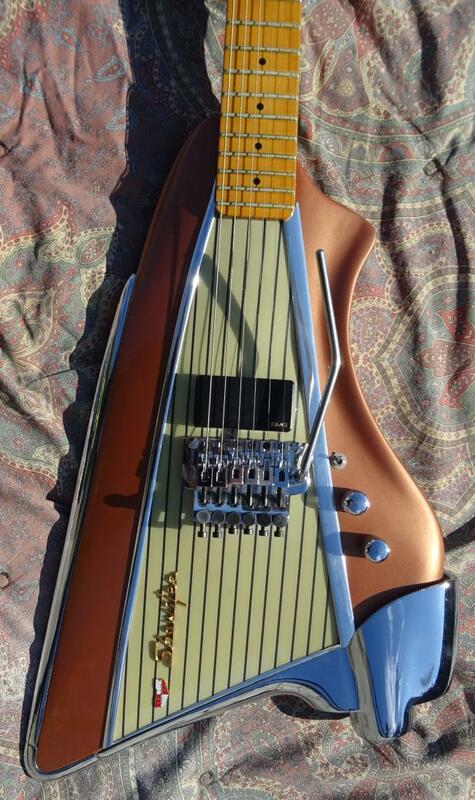 Fashioned from the turquoise fin of a '57 Chevy Bel Aire, the axe will certainly drive their musical point home during the next Xtender gig. 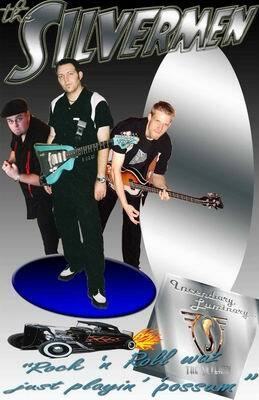 Look for another visit from these no-nonsense rock 'n' rollers; they'll be booking local clubs soon. 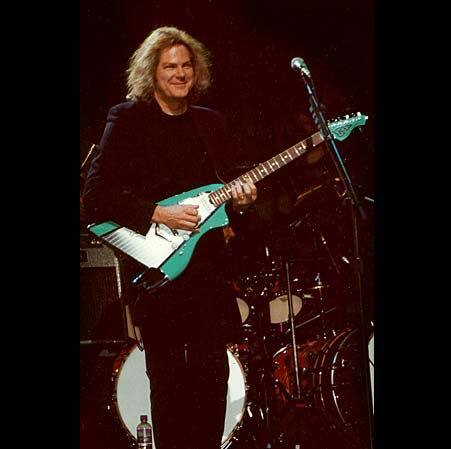 SAN JOSE, Calif. (April 25, 2002) -Rock 'N' Roll collectors can't miss the Rock Legends Vintage Instrument & Music Auction that shares the spotlight at eBay Motors' "Motors and Music," May 31-June 2, 2002 at the Mandalay Bay Resort & Casino in Las Vegas. Up for bid at this three-day auction extravaganza of collector cars and automobilia will also be some of the rarest, most unique and esoteric music collectibles ever offered to the public. The Music Memorabilia auction will also include simultaneous bidding on the internet at www.ebayliveauctions.com. 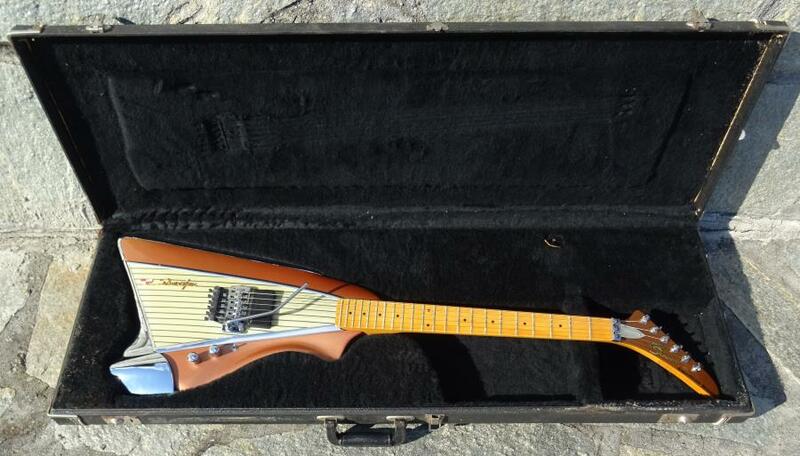 Besides many one-off guitars by superstars like Jimi Hendrix, Frank Zappa, Eric Clapton and Stevie Ray Vaughn, there's also an American Showster guitar designed from the tailfin of a '57 Chevrolet Bel Air. 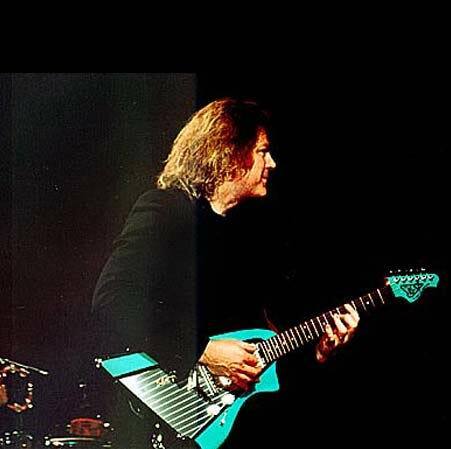 From Gene Simmons of Kiss to Gene Autrey, America's singing cowboy, there's a limited edition guitar designed for and/or autographed by their former owners.